My Honest Chegg Tutors Review (aka InstaEDU Review): Is It Legit? 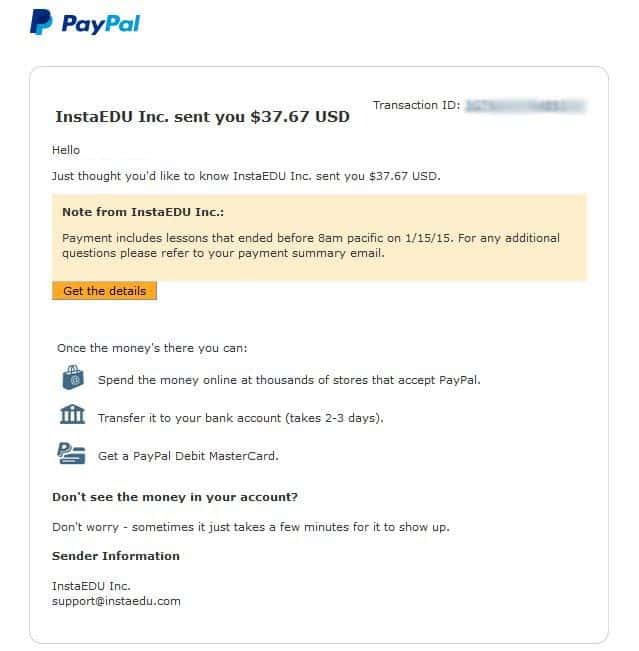 Following is a detailed Chegg Tutors review, where I’ll explain why Chegg Tutors (aka InstaEDU) is the best place to tutor online and earn money through PayPal at the rate of $20/hr. The tutoring site was previously called InstaEDU before Chegg rebranded it as Chegg Tutors. Chegg Tutors (aka InstaEDU) is an online tutoring platform that matches students who require academic help with tutors. I will briefly discuss the great things about Chegg Tutors and how to be a successful tutor on it. My advice mainly covers how to get and retain students. If you are going to enjoy the service, you will actually make great money with it. Log in now and connect with available requests in these subjects on the opportunities board! How much can I earn with Chegg Tutors? 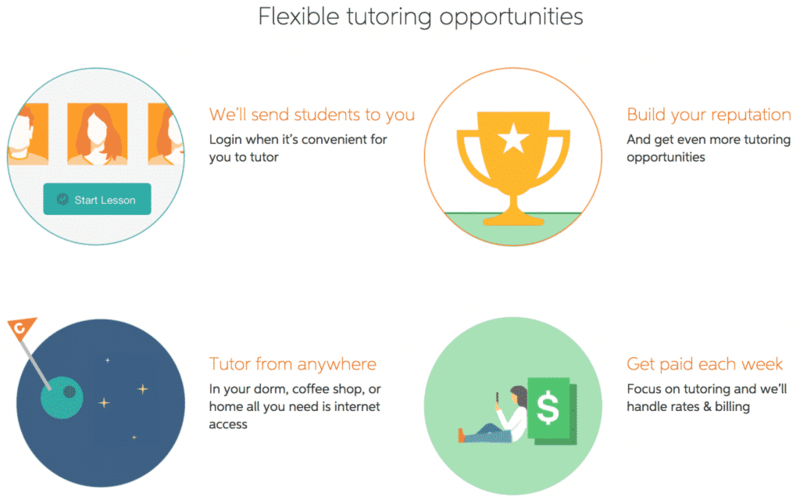 Chegg Tutors pays $20/hr, prorated to the minute, which is quite nice. You get what you invest! They send payments to your PayPal account each Friday. There are no minimum cashout amount. It has almost been a year and I haven’t heard anyone having issues with their payment processing. Under the payments section, you can update the Paypal email ID where you want Chegg to send your weekly earnings. The payments are dispatched on Fridays. For reference, this is what an email from Paypal might look like when you get paid by Chegg Tutoring. Tutoring with Chegg is a great job especially during school because it allows you to set your hours and work as much or as little as you would like. Getting students will be slow at first, but once you get a few students and get some good reviews going, things WILL start picking up. Chegg Tutors also provides a well-built lesson space. The audio and video features that are built into the lesson space are great teaching tools. Audio is essential for a productive lesson. Text itself will not cut it. Video is not as essential, but it gives the student another way to connect with you and make it more personal. Make use of the tools that Chegg Tutors gives you like the text editors and the new code editor. You can go into a “mock lesson” just to play around with those tools before working with your student. Money is made in tutoring by being able to teach students. Even if you’re new to tutoring online, you likely already have that skill or the aptitude to develop it. The other part of making money is treating your work as a business and shaping the service you provide to match what your students need. You can split your students essentially into two different groups: the ones that are looking for a question to a problem and then will be done with the service (or use it sporadically), or the ones that want to continually meet with you throughout the semester (or even across multiple courses). Both groups can be very profitable for you and both groups have different needs and require different things from you. Students in general will stick with a tutor if that tutor is able to teach them effectively, and getting them to stick around is how you turn that original $20 they give you into a couple hundred dollars. At the rates they pay, it’s a huge risk to “shop around” as you could find someone you like less than the one you’ve found that you do like. Any shopping around comes from the fact that they weren’t satisfied with the tutor and they are looking for a better one. I’ve had students work with me for multiple different courses so far including those who wanted to meet for 1-2 hours a week for the semester. That money adds up real fast. Getting yourself a base of students who routinely come back to you is what I found to be the most profitable and you do that by excelling at teaching the students in the first group. That again is done just by knowing what’s tricky in your field, and then excelling at explaining those concepts. You’ll see such information bars on your profile whenever there are tutoring opportunities related to your field. In addition to the information bars on profile, a small chat pop-up also appears on the right side bar. Make sure to act soon before someone else grabs it. Most lessons are set up when students send message to tutor (you). Be on top of your messages!! For students in group one, the fastest response typically gets the student. For those in group two it’s pretty much the same. Messages have one added benefit over on-demand and that benefit is that you can talk to the student about the problem. If you don’t know how to solve it, don’t take the lesson. Stick with what you know, and maybe some things slightly outside of that area, but don’t ever take a shot in the dark. That is a waste of your time and the student’s. Sure, you might make $20 or so off the lesson, but you also could be missing out on working with that one student who could eventually stick with you for longer time. Anybody from any country can signup on Chegg Tutors. The pay is the same $20/hour. Chegg Tutors is global, which means you can sign up regardless of whether you are a US citizen or not. You have to use your Facebook account while signing up on Chegg Tutors. Your account isn’t required to be as professional as LinkedIn, but it helps if you put up a friendly profile picture and your real name. Later, you’ll be added to the secret Facebook Group where other tutors pass opportunities to you when they are busy. You’ll also need to verify that you are a college student, or graduate, or alumni, or at least have some education. For this, you will be asked for a scanned copy of your diploma. An email sent from your .EDU email will also suffice. It really doesn’t matter which college you go to or graduated from… If you are willing to tutor, you are welcome! There is nothing to lose. Signup, try the opportunities, make some money. If this is not your thing, move on. But if you happen to like Chegg Tutors, it will be a bonus on your resume, and a bonus for your monthly earnings! If you’re ready to start: Sign up as a Tutor. That’s it! I hope this CheggTutors review was helpful. Tutoring is a great venture and CheggTutors is a great place to do it. If you have any comments, leave them down below. Good review. I have been on InstaEDU for a while now. The business is slowly heating up for tutors since most schools/colleges will be open starting this coming week. I am ready! I have been a tutor for so many years. I then came across your article and began online tutoring. Thank you, I am doing well on Instaedu. I kinda love it. I made $90 last week and got my payment without trouble. I can vouch for InstaEDU and I’d recommend everyone to try it. You can make your pocket money off of it quite easily. What’s the limit of earning? Like, does Instaedu stop you from tutoring if you hit certain weekly limit of something? I just signed up and look forward to tutoring some students in the subjects I am comfortable with. Sorry for the late response. If you’re still looking for answer: no, there’s no limit to how much you can earn on InstaEDU. Sometimes they have peak hours where the pay is greater than $20/hr. It usually takes place during the finals. Good to know Walter, good luck! I am an Indian. I also want to work on chegg. I want to know what are opportunities for indian. I have already started the procedure, but instead of my paypal account they are asking me for my account no., scanned copy of PAN card and education certificates. So Should I give it? It is normal for tutors outside of USA to be asked for PAN and education certifications. They do it for tax purpose and verification before they can approve you as a Chegg tutor. Once done, you can provide paypal email in your profile. hello ,,thanks for sharing your views ,we all got help from this .I just completed my profile today here and they replied me to email back till 18 (7 days after ).I m just nervous will they like my profile or not …. i am very confident but my question is -what are your experience when it comes to the difficulty level of the questions ? The difficulty of the questions will not be overwhelming because tutors get opportunities related to their expertise (from what they opted in their profile)… Moreover, you don’t have to teach all the students. When there is a teaching opportunity, the student will post question (often a PDF) for tutors to see. If tutor feels comfortable with the material, they can start the lesson. If not, they can let the students know upfront so that the student can approach another tutor. Once you get the hang of it, tutoring online becomes very comfortable. I have been tutoring on Chegg.com (InstaEdu previously) for approximately a year. I want to put in my point of view because I don’t tutor computer science or math, so I am automatically in one of the tutoring categories that are not in high demand. The first semester that I tutored, I earned between $0.00/month and $200.00/ month. I did get some work during the summer, but many of the students were students that I think of a “needy” — that is, they want a lot of your time but don’t want to pay for it. This semester I am doing much better. I am making between $100.00/week and $150.00/week. I also have students asking for me now that I have some reviews and that really helps. So what are some of my thoughts about this. First of all, if you are not teaching computer science or math, there will be fewer jobs available than some of the reviews lead you to believe, particularly at first. Secondly, if you want to earn $100.00 — $200.00 per week, you put in a lot of time waiting for students to come online and ask for help. If you want to sit around and facebook for 8 hours, that’s great, but if you have other things to do, that’s not so great. Some days, I spend hours online and only earn $20.00 that day. That is disheartening, but those days are becoming fewer. The main problem with this is that in order to earn $100.00/week, you should work only 5 hours that week. What really happens is that you need to be online at least 20 hours per week to earn $100.00. That does not equate to $20.00/hour in my book. So be prepared to put in a lot of time in order to get reviews and some pay at first. Don’t get discouraged. Also I have not seen Chegg offer over $20.00/hour in any subject other than economics. Still, $20.00/hour is not bad compared with other services. Another problem is that some lessons take preparation and you are not paid for prep. For instance, a student has a lesson that is based on an obscure video that not many people have seen. You have to watch it in order to teach the lesson. The video is an hour long. That means that you have just earned $10.00/hour rather than $20.00/hour. In other cases the student wants you to read their lab report/manual before giving a text lesson. Again, you have to spend time doing this. I realize that many tutors don’t do this, but I feel I owe my students the best I can give. It would be nice if Chegg could provide tutors with at least some pay for preparation but I realize that this is a business. I have heard of complaints due to people being removed from tutoring due to bad reviews. Many of the complaints state that they got bad reviews because they followed the honor code. I too, have had bad reviews due to following the honor code or due to technical problems, but in each case, I have asked to have the review removed and was able to prove that I had been following the honor code (I explicitly explain the code to students and that way I have a record). In all cases where I notified Chegg of the problem, Chegg removed the bad review. The main complaint I have is that there are obviously tutors who don’t care about the honor code. That not only hurts me, but hurts the student. There are two areas in which Chegg could improve at this time. The first is that there are a lot of technical problems right now. I don’t know if this is because of the number of students and tutors online, but I get disconnected at least once or twice a session now. I have had students getting disconnected constantly. I can’t load pictures into my whiteboard and there are other technical problems. The worst part about this is that the support people seem to be so backed up that I never get an answer to my queries about these problems. Chegg needs more support crew (hire me). A second issue is that I know at times that I have been the only microbiology tutor online and would be the best person to answer a question (i.e. the question is directly in my field of research), but someone who has a basic biology degree gets the question. The reason is that I can’t list microbiology as my top subject. That means that I don’t get picked, even when I am the expert. I have to list that I am a microbiologist under health and medicine or under biology. In general, I do like working with Chegg but the point I’ve been trying to make is that it is similar to starting any business. You need to work at it to make money and you need to put in time that you may not have. Some subjects are easier than others, but eventually if you work hard and get good reviews, students will ask for you. Learning to say no to “needy” students is essential and learning which types of jobs you should accept is also essential. Thank you for sharing your experiences EL. I am sure many people reading this page will find it beneficial. This site and the comments really helped me a lot. 1) i am an IT person but I used to teach long back. I do like teaching but don’t have much experience in teaching . So is it ok to go with Chegg. Com? 2) Is there any curriculum available for the tutor? 1) It’s perfectly fine if you do not have a lot of teaching experiences. After a few lessons, you will be able to handle everything as long as you know the materials you are about to help students with. 2) They don’t have curriculum but the best thing is you’ll be able to see the question that the said student needs help with. 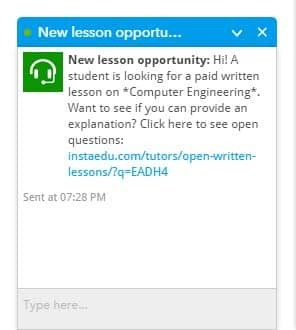 Or you can also message the student beforehand to ask the question/general topics. If you feel like you can solve the question and also teach them how to tackle it, teach them underlying logic — you should be fine. Thanks a lot for your quick and helpful reply. Wondering where does my document fits? The best way would be to contact their support. I know for sure that there are a lot of Indian tutors on Chegg. You can contact them directly and explain your situation. I’m sure they will let you into the system. Thanks a lot for your reply and help. Are you accepting applicants from the Philippines? If you do, can you give me a list of qualifications that I should have upon applying with your company? Been looking for a job as an online tutor and everywhere I looked they ask for a quiet place where I can teach, which is impossible for me. Hi Eve, Chegg Tutors does accept applications from outside the US. You can get a better answer to your questions if you contact their support directly. You’d need a quiet place if you want to do live video one-to-one tutoring but not if you want to tutor without audio/video, or solve the problems, etc. Quiet place will definitely be helpful though. Hi I am from India. I have created my account in Chegg. I want to know whether I will receive questions from Indian Students only or from other countries. Also will I have chance as a tutor if I’m not that fluent in English language? Sam, you may receive questions from any student that uses Chegg. If you can express yourself legibly and can tutor the students reasonably well, I don’t think you’ll have issues. You may also choose to only do written lessons for students where you do not have to speak verbally, but rather draw/type on the screen and chat with the student in a chat window. Maybe that’d help?